Our season started off in spectacular fashion with a once in a lifetime gala celebration of the Society’s 70th anniversary. The Gala was a resounding success and will be fondly remembered by all who attended. If you have not yet seen the full film produced by the Society for this occasion, I encourage you to view it on our website here; it is a wonderful tribute to the Lord Reading Law Society and the people who have led it throughout the years. Our Gala was such a success due to the tireless efforts of our volunteers and I want to thank them all once again, from the bottom of my heart. Despite a late start to our season due to the timing of the Jewish holidays this year, we have managed to maintain a very full schedule, having held our first Members-only CLE breakfast on November 20, 2018 at the offices of Lapointe Rosenstein Marchand Melançon on the very current topic of New Cannabis Legislation – What You Need to Know. The breakfast was sold out in minutes and was standing room-only on the morning of the talk. Thank you to our host firm LRMM and presenters Me Alexa Rahal and Me Stephanie Marcotte for a thoughtful and informative presentation on the newest legislation which has far-reaching effects on so many areas of law. You can read more about the breakfast further below in this newsletter. 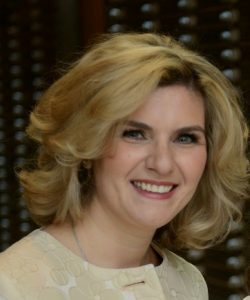 Our next event of the fall season, our upcoming dinner on December 6, 2018, will feature Me Arielle Meloul-Wechsler, Air Canada’s Senior Vice President, People and Culture; she is responsible for overall leadership for human resources, labour relations, communications, and culture change initiatives across the company. A member of the executive team since September 2013, she was previously Senior Director and then Vice-President, Human Resources. Prior to that, she was Assistant General Counsel where her practice areas included corporate financings, reorganizations, and M&A transactions. We look forward to welcoming Me Meloul-Wechsler and learning about the inner workings of one of Canada’s most iconic companies with her talk A Lawyer’s View from the Sky. Thank you to our sponsor, Kugler Kandestin for their generous support of this evening. You can register online here. On another, note, you have already received the notice to renew your annual membership in the Society or to sign up for the first time. I encourage you to pay your membership dues, as we count on those funds to help contribute to the health of the Society, to support the continuing program of outstanding speakers the Society has established, and to allow the Society to pursue the worthy causes with which the Society has engaged. Membership offers significant discounts for dinner-meetings, and exclusive access to the great members-only CLE events which we have planned. We’d love to have you as a member! You can pay your membership online here or alternatively, you may download the membership form here. I look forward to seeing you at our next dinner on December 6th and at our other events throughout the rest of the 2018-19 season. 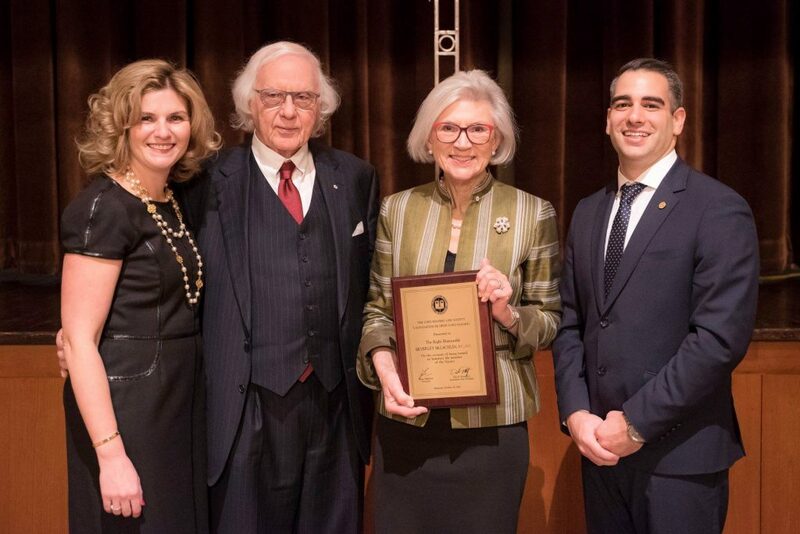 On October 24, 2018, the Lord Reading Law Society celebrated its 70th anniversary and conferred an honourary lifetime membership on Canada’s former Chief Justice The Right Honourable Beverley McLachlin, P.C. C.C. To celebrate our 70th anniversary, we unveiled a commemorative video featuring many of our past presidents, produced by the Society’s Archives Committee under the able leadership of Ashley Kandestin and Neil Hazan. Canadian Prime Minister Justin Trudeau also delivered greetings by video. These and other commemorative videos may be viewed on our website here. The Lord Reading Law Society has evolved from its founding in reaction to the exclusion of Jewish lawyers from a bar association convention, to what it has become today – an inclusive organization that fights for the human rights of all, while organizing gala dinners that attract a cross-section of Quebec jurists from all backgrounds to hear prominent speakers from the worlds of law, business and politics. Once dinner was served and a sufficient amount of “schmoozing” had taken place, Society President Inna Nekhim presented Chief Justice McLachlin with an ‎honorary lifetime membership in our association. Our guest speaker and honouree was introduced by her former Supreme Court colleague, and longtime Society member, The Honourable Morris J. Fish, C.C., Q.C. Chief Justice McLachlin has been awarded an amazing 36 honorary doctorates, began Justice Fish‎ (who has received several of his own!). Throughout her career on the bench, Chief Justice McLachlin demonstrated a passion for access to justice. From her appointment to the County Court of Vancouver in 1981, our guest speaker rose quickly through the ranks until being appointed to the Supreme Court of Canada in 1989. The Right Honourable Beverley McLachlin, P.C. C.C. served as the 17th Chief Justice of Canada from 2000 to 2017, was the first woman to hold that position and was the longest serving Chief Justice in Canadian history. 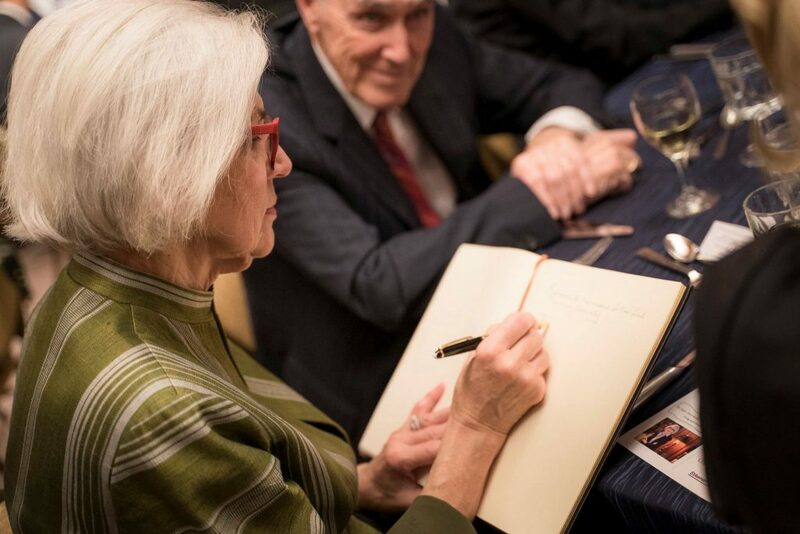 A true Renaissance woman, not only is‎ Justice McLachlin an accomplished jurist, but she has also published a cookbook and a novel, in addition to being a talented pianist. On a more personal note, Justice Fish, who was a colleague of the Chief Justice on the highest court for ‎some 10 years, expressed his “everlasting memory of the heart” for her sense of accommodation to others. 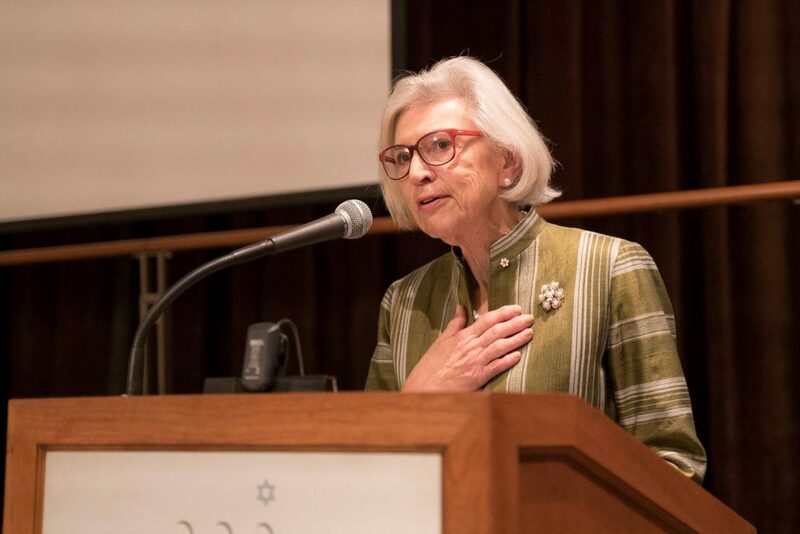 After Justice Fish’s warm introduction, Justice McLachlin stood at the podium and expressed her appreciation for the Lord Reading Law Society. From the thousands of cases over which she presided, the Chief Justice learned that diversity and human rights are two sides of the same coin. Diversity is our reality – particularly in Canada, but even on a more basic level, there are always differences between people. Men are different than women; we come from different cultures and we practise different religions. ‎That said, at the end of the day, we are all human beings. The law states that discrimination on the basis of immutable characteristics is evil. The innate dignity of each of us must be respected. Living with diversity means living under the rule of law and human rights. The 70th anniversary of the Lord Reading Law Society is significant because it commemorates what the Society has done to strengthen human rights in Canada ‎and to fight discrimination in all its forms. Seventy years ago, the Second World War had just ended. Millions of lives had been lost due to gratuitous killings based on deemed differences. Why had it happened? And how could we ensure it would never happen again? Much of the world resolved that human rights would henceforth be respected and that disputes ‎would be settled by law. International institutions like the International Court of Justice were established. Closer to home, the provinces started to pass human rights codes. Unfortunately, discrimination did not disappear in one fell swoop. Incidents like the 1948 ‎Quebec bar association meeting being held in a “restricted” hotel still occurred – all the more ironic because it was members of that same legal profession who were then drafting the texts of human rights codes! The resulting founding of the Lord ‎Reading Law Society illustrates the old adage that “Good can sometimes come from bad”. The 1982 passage of the Canadian Charter of Rights and Freedoms remains one of Canada’s proudest achievements. Our guest speaker was fortunate to have been a witness to, and indeed a key player in, Canadian human rights law, as her career on the bench tracked the arc of the Charter. Canada is now admired around the world for its protection of human rights. We cannot be complacent, though. Nowadays, the harsh wind of “swift solutions” and less regard for rights is blowing in Eastern Europe and elsewhere. In countries like Venezuela and turkey, judges are imprisoned languish in prison without having been subject to a fair and independent judicial complaints process. Even in the United States, we see a process for choosing Supreme Court Justices that politicizes the Court and lessens its credibility as an independent body, and a President who undermines respect for the judiciary by calling judges who rule against his orders “so-called judges”. We must guard against a return to instinctive tribalism. Our guest speaker reminded us that maintaining human rights is never‎ a “fait accompli“. Even after 70 years, the work of the Lord Reading Law Society is not done. “Thank you for the work you have done in the furtherance of human rights; and may it continue into the future”. As Society Past President Ian Solloway pointed out in thanking our guest speaker, her message is one of bridge-building; not constructing walls. In addition, the Gala received extensive coverage in Le Monde Juridique. You can read the edition on their website. We have some tremendous events planned for the rest of the season, so save these dates! Registration for these events will open in the weeks leading up to those dates, keep an eye on your email for more information. 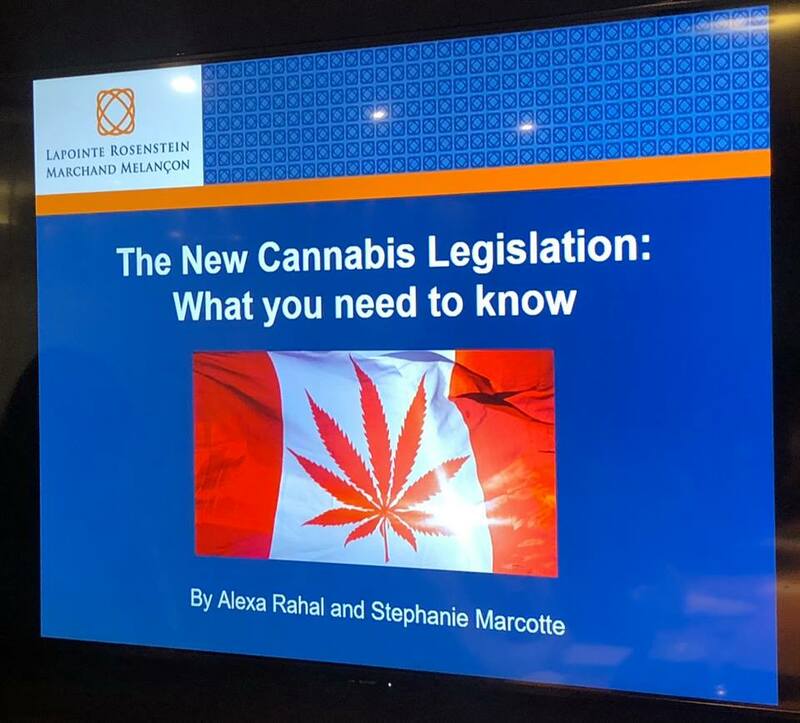 On November 20, 2018 at Lord Reading’s fifth-ever members-only CLE breakfast, attorneys Alexa Rahal and Stéphanie Marcotte of Lapointe Rosenstein Marchand Melançon delivered a fascinating lecture on Canada’s new cannabis legislation. Their talk was entitled “New Cannabis Legislation – What you need to know” and was generously hosted in the main boardroom at their firm in Place Ville-Marie. After a tasty breakfast of bagels and other baked goods (we know what you’re thinking… but alas, there were no funny ingredients in those baked goods: “Edibles” are not yet legal in Canada! ), Maître Rahal and Maître Marcotte provided the packed boardroom with a comprehensive overview of federal and provincial cannabis legislation, along with recommended changes to our clients’ business practices. The legalization of cannabis on October 17, 2018 is having – and will continue to have – repercussions in many areas of law, including real estate law, marketing law, and employment and labour law. In many respects, cannabis smoking is now regulated in the same way as tobacco smoking. For instance, one cannot smoke cannabis in many outdoor areas (e.g., within 9 metres of the entrance to an office building). However, some municipalities have gone further in prohibiting or limiting the use of cannabis within their borders. While federal law allows up to four cannabis plants to be grown at home, Quebec law is more restrictive and forbids the home growing of cannabis plants altogether. Residential landlords have three months from the October 17th legalization date to insert a prohibition against cannabis use into their leases. Similarly, co-owners in condominium buildings may wish to amend their declaration of co-ownership to prohibit cannabis use in common areas or even throughout the entire building. Employers may wish to impose a zero tolerance policy on cannabis use by their employees, given that cannabis is no longer an “illegal substance” subject to a general prohibition under workplace rules. That said, such a zero tolerance policy cannot be used as a pretext for conducting random screening tests of employees, as this would likely infringe upon their fundamental right to privacy. The advertising and branding of cannabis is strictly prohibited, in order to minimize the appeal of the substance to youth, among other policy reasons. Incisive questions from the attentive Lord Reading audience led to discussion of potential court challenges. For instance, prior to legalization, the sale and use of cannabis was prohibited, but selling a T-shirt bearing the cartoon image of a marijuana leaf was perfectly legal. Strangely, the situation is now reversed – with cannabis use now being legal and cannabis branding being prohibited! 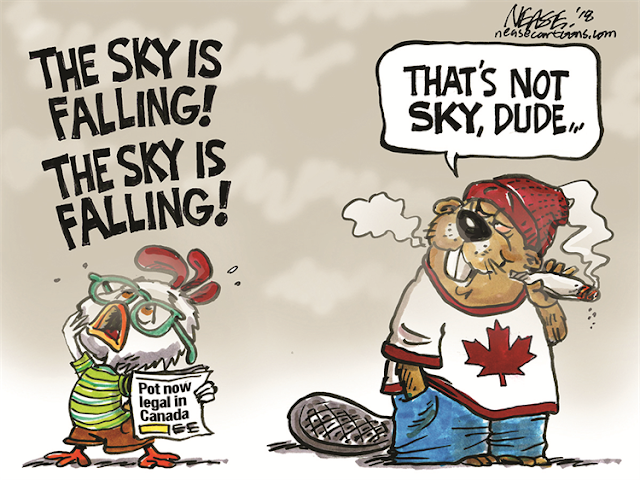 Don’t be surprised to see the prohibition against ‎depictions of marijuana leaves on t-shirts being challenged in court one of these days: The government’s logic is that prohibiting cartoon characters glorifying cannabis will prevent marketing efforts targeting youth. The other side of the argument is that freedom of expression should permit the printing of cartoonish depictions of marijuana leaves on T-shirts. Indeed, The Times, They are A-changin’!